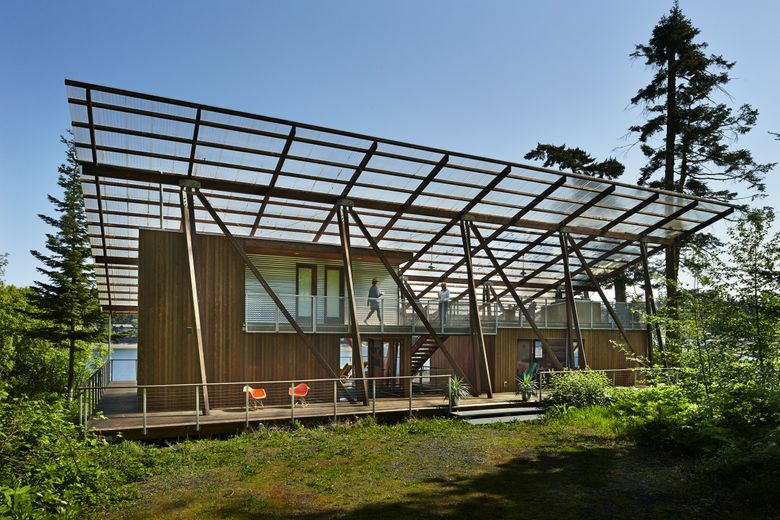 This contemporary cabin, across from a Marrowstone Island oyster farm, goes both ways; nautical one side, deep woods the other. 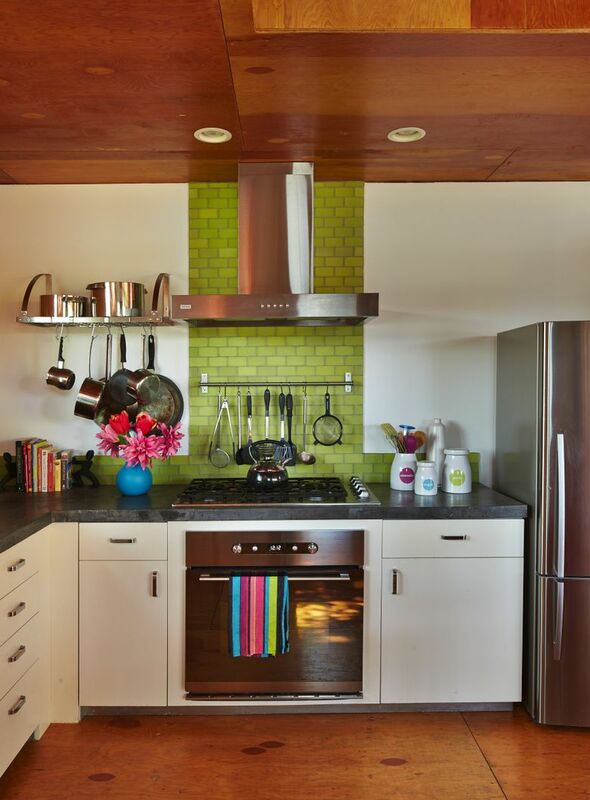 It was guided to colorful completion by interior designer Michelle Burgess. That’s what Kristin Hall wanted: a place on the water that felt like summer camp. With lots of wood and outdoor pathways to little rooms that felt like cabins. And a place for the canoe. 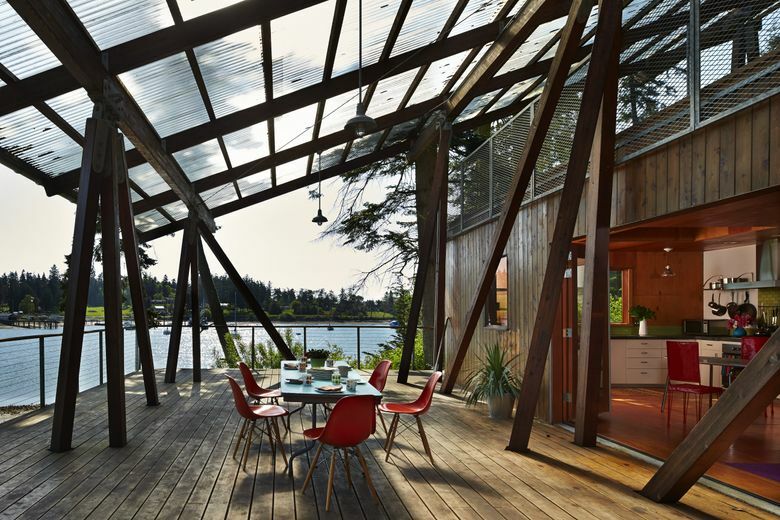 But all of that in one house, under one canopy, attached by a single deck and suspended over the beach of Marrowstone Island. 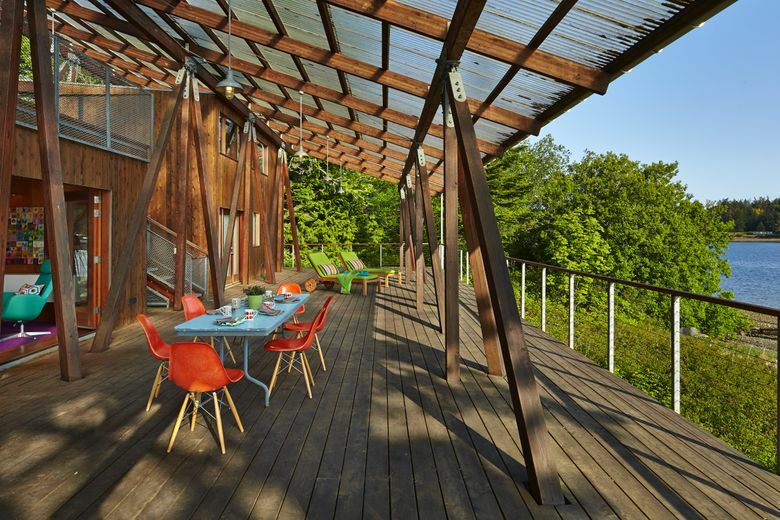 “I don’t have a spatial mind,” Kristin says, seated in the living room of the contemporary and largely plywood cabin she and her husband, David, share with their son, Joe. As a kid, Kristin toasted her s’mores around the campfires of Minnesota, land of lakes and forests. But this place, across from an oyster farm, goes both ways; nautical one side, deep woods the other. “I love it when there are people reading on the deck, somebody takes a bike ride, and somebody else takes the canoe to the store for an ice-cream bar,” says David. Building here on Mystery Bay was a 10-year process of fits and starts. So that the shoreline home sits lightly on the land, 73 glue-lam beams, each a different length and angle, are anchored to concrete blocks. The structure rises and floats from this base. 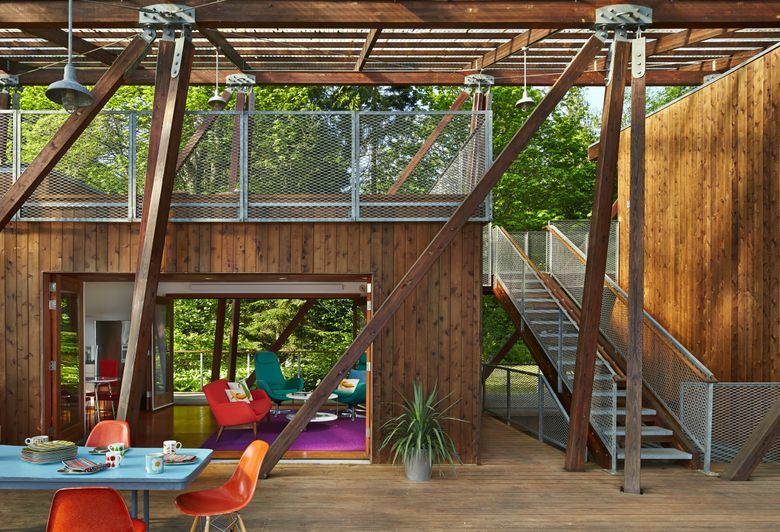 Architectural firm Anderson Anderson drew up the structure, and then, about six years later when the couple was ready to build, interior designer Michelle Burgess took the drawings and ran with them. She amended plans, designed built-ins, had a hand in plumbing and electrical, designed the low-maintenance and modern interiors, chose finishes and lighting fixtures, and helped Kristin with furnishings. Much of the interior, in this home designed for minimum fuss and maintenance, is “simple Scandinavian-inspired furnishings.” Much of it came out of Ikea boxes — including the oven, beds, dressers, a desk, table lamps, shelving, kitchen table, wall cabinets and bedding. The Halls are city folk. He is the deputy city attorney in Everett. She is assistant general counsel for the Snohomish County Utility District. And this place of theirs “is like a little magic kingdom for us to come on the weekends to get refreshed for the week in the city,” he says. And by that she means any trip from the living room/kitchen box (with its “cocktail deck” overhead) to the bedrooms next door: guest loft over master. 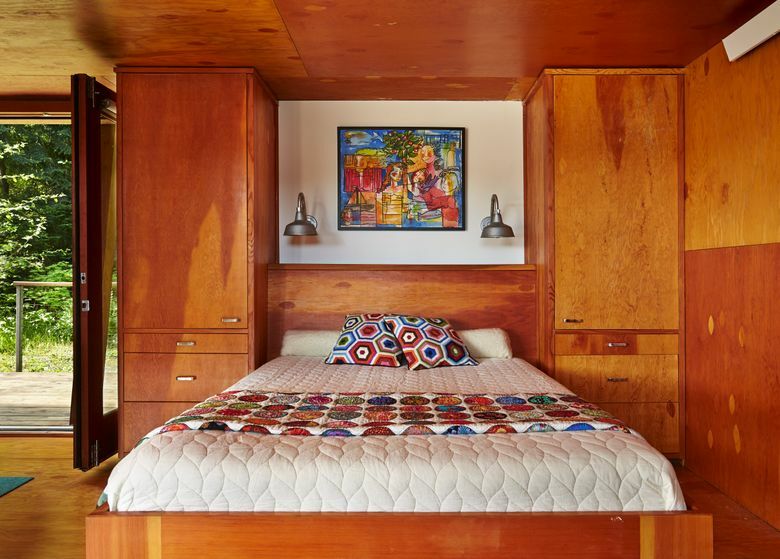 Baltic plywood continues as the defining element, used even for the couple’s headboard and built-ins. The bathroom also includes an exterior door, for access off the beach. 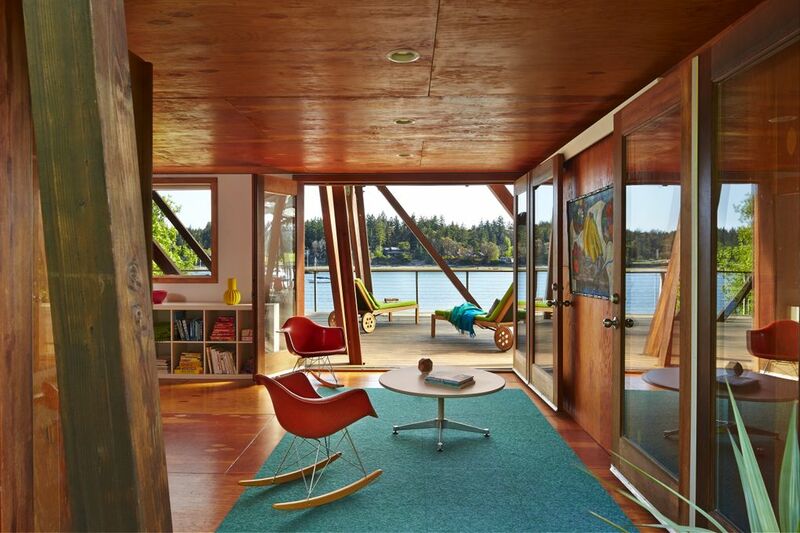 Head outside and down, and there is a separate room with a big built-in bench seat and television (hot pink, chartreuse chaises, tomato-red pillows). The footprint of the place is 3,200 square feet, much of it taken up with decks; waterside it is 25 feet deep. “At night when we turn on the overhead lights on the deck, it looks like something out of ‘The Great Gatsby,’ ” says David.